It is estimated that some 300 study consultancy firms have been established amid the increasingly high demand for overseas study of Vietnamese students. However, many of them have been found as not meeting the requirements for operation. More and more study consultancy firms have come out, while their service quality has not been put under the control of any state management agency. Therefore, parents do not know where they should go to get true information about overseas study. When typing “cong ty tu van du hoc” (study consultancy firms), one may get 7,060,000 results after just 0.49 seconds. And, if searching for information about university scholarships, he would see 251,000 results just after 0.46 seconds. 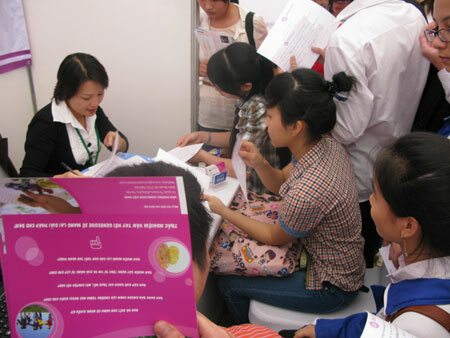 Some consultancy firms attracted parents and students with sweet words about scholarships. “ILA Vietnam promised to show the way to “hunt” for a scholarship which surely can produce the desired effect,” a parent said. “I found the information that Royal Road University in Canada offered the scholarship valued at 50 percent of tuition – the only opportunity of the year. I also found the information about the pre-university scholarship at Tailors College. However, most of the provided information was out of date, because the scholarships were reserved for 2011,” he continued. Another parent also said New Ocean Group, a study consultancy firm, advertised that it’s easy to obtain the fellowship worth 3000 NZD at PIHMS, but this was the scholarship for 2011. On the official websites of many consultancy firms, one could find a lot of ad pieces about fellowship. Atlantic, for example, advertised the program in New Zealand under which students can enjoy 6-month free English training course and the scholarship of 1000 NZD. A consultancy firm promised the high percentage of people getting visa (90 percent), affirming that students can get the chances to work in Canada for three years after they finish school. Meanwhile, the students, who choose South Korea or Japan for their university study, would be able to take part time jobs to earn 800-1000 dollars a month. Especially, consultancy firms have also offered gifts to their clients. For example, those, who go to Australia would be given an electronic dictionary, while those, who go to America would be propped up visa fee. Vinahure advertised a lot of study programs in Singapore with the fellowships of between 1000 and 5000 Singaporean dollars. On the website of SAIT, one could find the information about the fellowships for journalist training courses in the US granted by the centers in the country. In order to obtain a full scholarship at the Australian International School reserved for excellent high school students in the 2012-2013, besides necessary formalities, every client would have to pay the fee of 3,225,000 dong. This is the requirement set up by AIIS Company with 15 full and partial scholarships. Students have to commit to pay the non-refundable admission acceptance fee of 63 million dong. The scholarships would be reconsidered every year and they would be taken back if students cannot meet the requirements on the learning records. “Since study consultancy firms do not bear any control from management agencies, it’s very difficult to verify the information,” Van Nhu Cuong, President of Luong The Vinh High School, a well known educator in Vietnam noted. Most of consultancy firms try to speak very kindly of the training quality and job opportunities in foreign countries. An officer of the firm on Thai Ha street in Hanoi told a parent that he should choose either the training courses in Australia with the cost of 600 million dong a year, or Europe 500 million dong, affirming that though having to pay high expenses, parents would be able to earn money in the countries later by taking part time jobs.